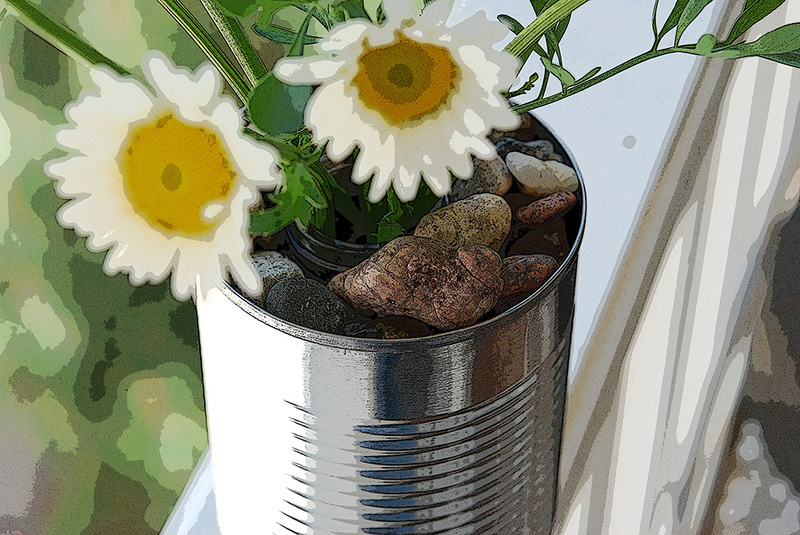 Love Daisies, Love Tin Cans. 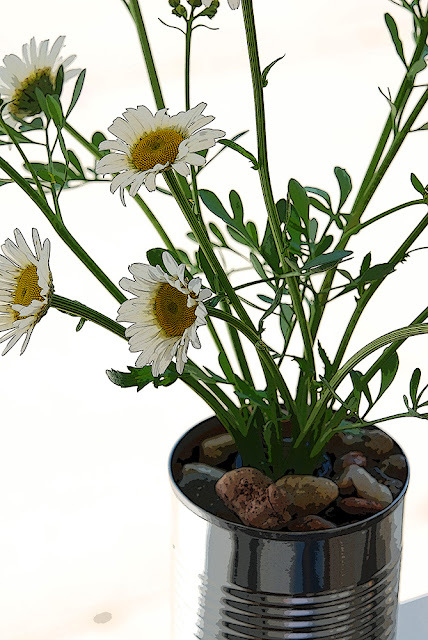 - Jill Ruth & Co.
Old salt shaker + tin can + rocks from your lane = cool "artsy" vase. Top your photo off with "posterize" in photoshop for a little more pizzazz! I had these photos and this post ready to go earlier in the week but Blogger wasn't cooperating...then "life" didn't cooperate. My husband is in the hospital now post surgery from a sudden infection in his foot. He is doing well thanks to many prayers said as he was quite a sick man on Wednesday. I'm having a little down time with my youngest kids tonight and thought I would see if I could finally get this posted. Our little girl turned 6 on Wednesday when he got sick so she is very patiently waiting to celebrate her birthday. I guess we'll open presents in the hospital as he'll be there for a few more days. ....praying for good health for all of you too! I hope your hubby will be out of the hospital soon. I hope the daisies cheer you up too, since they are one of the happiest flowers around!! What a cute,simple idea...I have daisies waiting to be picked from my garden,thanks for the inspiration! Hope your husband is on the mend! Take care of yourself too! You have a beautiful post with your tin can vase ..... And I am glad to hear that your husband's infection is getting better. That is NOTHING to mess with for sure!!!! Enjoy your girls and life as it is happening - hectic and crazy and peppered with prayers of friends and patience of a 6 year old. great photos - and as I was organizing some stuff in my studio into tin cans, I was just thinking how much I love tin cans! Take care of you - and I hope your husband gets to come home soon!!! I hope your husband soon feels much better and heals completely. I like daisies, too - they are such "friendly flowers" as Meg Ryan's character says in You've Got Mail. How awful for your husband! But thank goodness it didn't happen a couple of weeks ago, right? But if he farms, there is no good time to be down with a bad foot! Take care of the littles and yourself. Posterized, huh? Cool! I'm glad all is well now and I'll be praying for a speedy recovery. Hopefully he'll be back on his feet (both of them) quickly. What a sweet girl to want to wait for Daddy. Bless her and all of y'all. Oh my dear Jill...so glad to hear your sweetheart is on the road to recovery...I can only imagine the scare of it all! Prayers are winging their way for Dad to be home real soon. I'll be praying for your family! What a difficult time it must be! After spending 9 days in the hospital myself only just a week ago, I have a LOT of empathy! May God use this time to bring you "hidden" blessings through the difficulty. Blessings! Beautiful post. I, too,....like Patty...love the outline on the daisies... Need to try that soon. Hope your husband is healing rapidly.... I know he is! Happy birthday to your little girl! Lovely photos!, the daisy tin can is so pretty, I'm going to try it!! A speedy recovery to your dear hubby. Holy Cow! 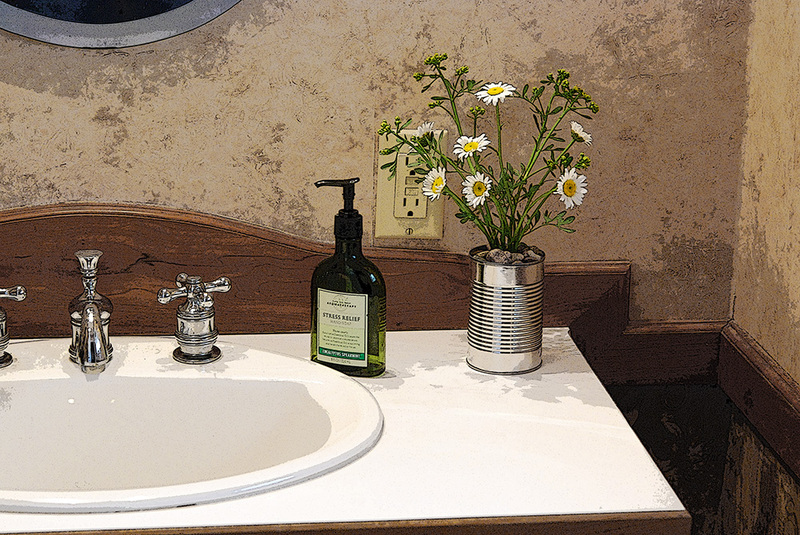 That can of daisies looks amazing in your bathroom. The can sets off your chrome fixtures.